The U.S. Army Corps of Engineers is seeking public comments on its recently released draft environmental assessment of Caspian tern habitat reduction on East Sand Island in the Columbia River estuary near Chinook, Wash. The Corps proposes to reduce the Caspian tern nesting area on East Sand Island from 1.58 to 1.08 acres to decrease the number of nesting pairs on the island and, as a result, reduce tern predation on passing juvenile salmon and steelhead that are listed under the federal Endangered Species. The draft EA assesses potential impact on birds, fish and other ecosystem components of a reduction in available habitat and of a no action alternative. Comments received by Feb. 21 will be assessed and a final EA produced over the course of the winter. It is hoped the National Environmental Policy Act process can be completed before the migratory birds arrive this spring to nest, said Corps project manager Sondra Ruckwardt. The island has in recent years been home to what is believed to be the largest colony of nesting Caspian terns in the world. The desired reduction in nesting pairs is in response to unexpectedly high nesting density exhibited by terns at the colony. The draft environmental assessment for the proposed activity is available for public review and comment on the Corps' Portland District website at www.nwp.usace.army.mil/Media/Announcements.aspx. Questions or comments regarding the draft EA should be directed to Steve Helm by phone at 503-808-4778 or email at Steve.R.Helm@usace.army.mil. Comments can also be submitted by mail to District Engineer, Portland District, U.S. Army Corps of Engineers, Attn: CENWP-PM-E/Steve Helm, P.O. Box 2946, Portland, OR 97208-2946. For more information about the Caspian Tern Management Plan, visit www.birdresearchnw.org/Project-Info/Project-Background/Caspian-Terns/Caspian-Tern-Management-Plan/default.aspx. A tern management plan completed in 2005 called for the relocation of 60 percent of the East Sand Island colony population to specially constructed habitat (islands) in Oregon, California, and Washington. Reduction of habitat on East Sand Island would be contingent upon creation of the new islands at an area ratio of 2:1. Because Caspian terns nested on an average of 4.4 acres from 2001 to 2004 on East Sand Island (range from 3.9 to 4.7 acres), approximately 6-7 acres of new suitable habitat would need to be created to reduce the East Sand Island habitat from between 1 to 1.5 acres. The acreage on East Sand Island was selected because it was assumed it would be adequate to reduce the number of breeding pairs down to a range of 2,500-3,125 and that a smaller Caspian tern colony on East Sand Island would achieve an overall increase in salmonid population growth rates. Islands constructed by the Corps to date all are located east of the Cascade Range in southern Oregon and northern California except for Fern Ridge which is located in the southern Willamette Valley in Oregon. The proposed action would address actions called for in the 2008/2010 biological opinion for the Federal Columbia River Power System. The BiOp describes actions NOAA Fisheries feel are necessary to avoid jeopardizing the survival of list salmon and steelhead species. This biological opinion requires implementation of the 2005 Caspian Tern Management Plan and evaluation of the effectiveness of the plan. The proposed action is considered adaptive management toward meeting the goals of the opinion and plan, specifically with respect to number of nesting pairs of Caspian terns at the East Sand Island colony. The habitat reductions to date have not achieved the desired result so far. "The amount of nesting habitat available to Caspian terns on East Sand Island has declined since 2006 from about 6.5 acres to the current 1.58 acres," the draft EA says. 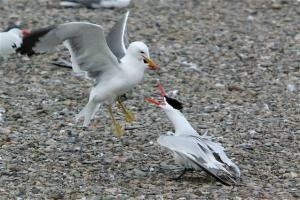 "Year 2013 marked the third year that Caspian tern habitat was managed between 1.58 to 2.0 acres. "This reduction was expected to result in 3,125-4,375 nesting pairs (ROD). Despite incremental reductions in the amount of nesting habitat, numbers of nesting pairs and amount of predation on juvenile salmonids have remained fairly constant. "In 2013, at 1.58 acres of nesting habitat on East Sand Island, the number of nesting pairs was near 7,600 and predation on juvenile salmon was near 4.7 million (Roby et. al. 2013). Neither the FCRPS BiOp objectives for juvenile salmon survival nor the purpose and need of the EIS/ROD have been met. This indicates that additional actions are needed," the draft EIS said. "The density of Caspian terns nesting on East Sand Island in 2013 was approximately 1.2 nests per square meter resulting in approximately 7,600 nests, the highest density ever observed in the Columbia River Estuary," the draft EA says. "If nesting occurs at this density in 2014 over 1.08 acres, approximately 5,200 nests would result. This is approximately 66 percent more pairs than the high end of the range identified in the 2005 environmental impact state for the management plan of 3,125. "Reduction in nesting area on East Sand Island is expected to result in movement in future years of some terns that would have returned to East Sand Island," the draft says. "In 2013, approximately 680 Caspian terns moved from East Sand Island to some of the constructed inland sites, including Summer Lake, Malheur Lake, Crump Lake, Sheepy Lake, and Tule Lake." For more background, see CBB, Jan. 3, 2014, "East Sand Cormorant Colony Increasing; Estuary's Single Most Significant Source Of Smolt Mortality"